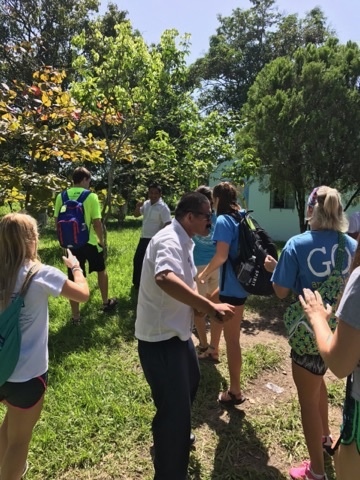 To start our final day as a team, we all got on the bus to head to a hospital by the name of "Ayúdame a Vivir," a hospital for children with cancer, where Sus Hijos has been to only a few times before. We arrived and first saw the waiting room, where there were around 20 people, mostly women and children, sitting. We began handing out blankets and treat bags to all the kids we saw in the waiting rooms, we prayed for the kids we were with and prepared everything we would need to take with us when we visited the kids, as well. The night before, our team stuffed 100 teddy bears, which we had ready to give out, as well as a few bags of the stuffing and empty teddy bears so that the kids could make their own. When it came time, the group that I was with, along with a translator went to the back to wash our hands and get a mask before visiting the kids in the hospital beds. We talked to about 10 kids, and each one was so special in a different way. 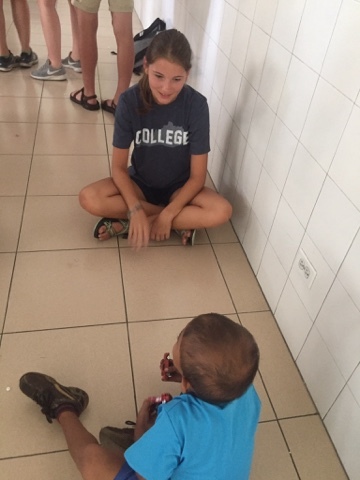 We asked them their names, ages, gave them stuffed animals, and prayed with them. It was so special, and a true blessing from God to be able to spend this time with them. Especially to bless the family members with the kids, letting them know how loved they are, and that God is so present on their journey now, no matter how tough it may seem. It brought me to tears, the kindness they showed. One boy in particular was so excited to be able to make his own teddy bear and had it all made by the time we had talked to all the other kids. God was so present in that hospital, and I pray that the families felt Him then, and for all the days to come, no matter how difficult it seems. After praying with all the kids we went back to the waiting room and laughed and played with the kids for a while longer. It was hard to leave, but worth it to know we made them smile, if only for a few hours. After, we ate dinner at States Diner, and headed to the Souvenir Shops. 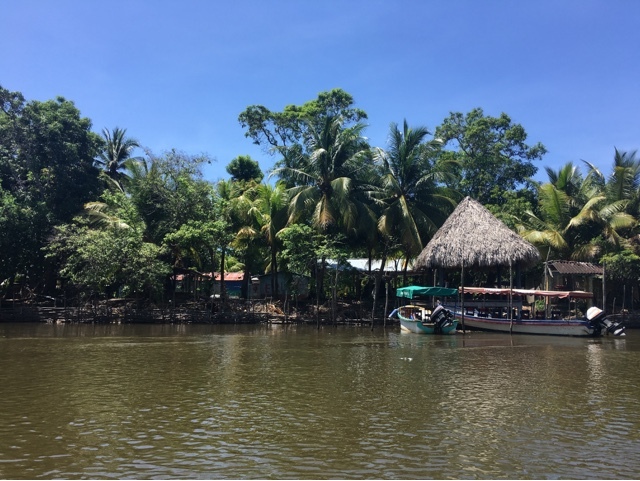 It is always so cool to see the market, and the incredibly detailed handmade items they sell, following this, we went to another orphanage, called "Puerta de Amor." This orphanage had 7 girls and 1 boy that we got to visit. It was small, but I was very excited to be able to spend time with these few kids, so that we could be able to get to know them all. We became by introducing ourselves and the activities for today. 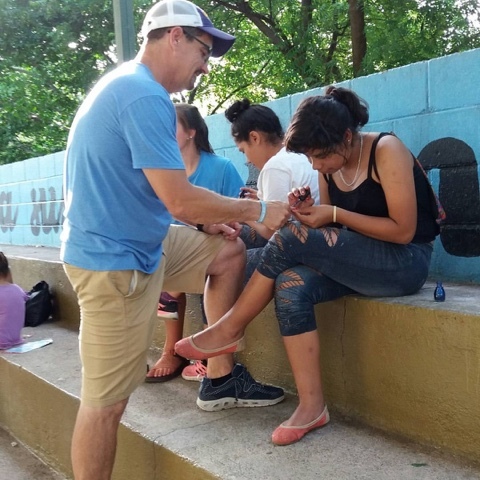 The one boy and the boys on our team headed outside to plays games and one of our translators, Miguel, began to explain to the girls the bracelet we were going to make with them. He told them what each color represented, and spoke to them about God's love and the meaning behind each color representation. It was really powerful, and following that, we separated into about two girls with 2-3 of our team along with a translator. This was my favorite part. I got to explain to them what each color means to me, what God's love means to me, and how much we love and care for them as well. I could tell they really heard what we said and it was so cool for me to speak to them in this way. Following this, we spent the rest of our time there, playing softball and volleyball and truly having so much fun with these kids. We prayed and got to hear a few of the girls say their thanks, which is so special to hear, because what they don't know as they are thanking us for being there, is how much they are actually blessing us. 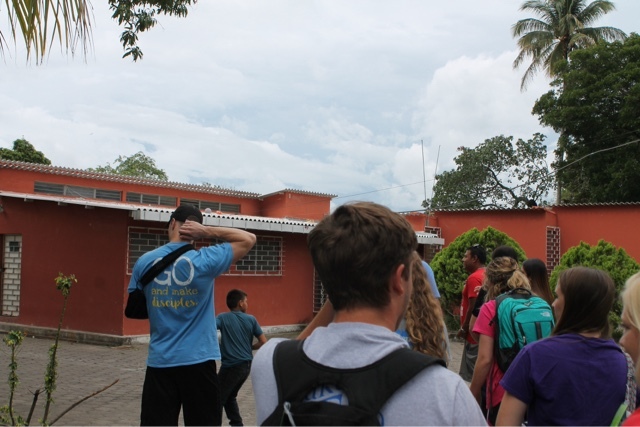 We toured their orphanage, and it brought me joy to see it in such good conditions. I am happy leaving knowing that they have people who love them, beds to sleep on, and smiles on their faces from the few hours we spent together today. After this, we had pupusas and walked to the overlook to finish off an amazing week. I can't speak for everyone, but I know that this week God spoke to me, God gave me strength to serve wholeheartedly everyday, and He has blessed me significantly in letting me see and experience everything I have this week. 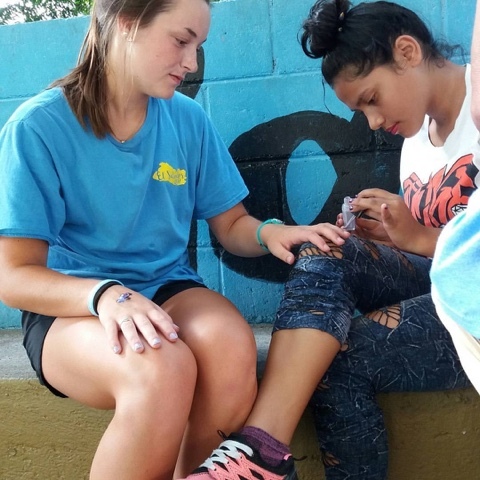 Today, we woke praying the rain would hold off so we could enjoy a beautiful day with some young ladies from CIPI, Trata, and teen moms from SVDP. Our team ate our breakfast, prayed and left to go pick up girls from one of the centers. After a long bus ride, we made it to the beach house where we unpacked and began setting up for the fabulous day ahead. There was a pool, hammocks, and of course sand and ocean all available for our pleasure. We started in the pool where kids began laughing and splashing instantly. 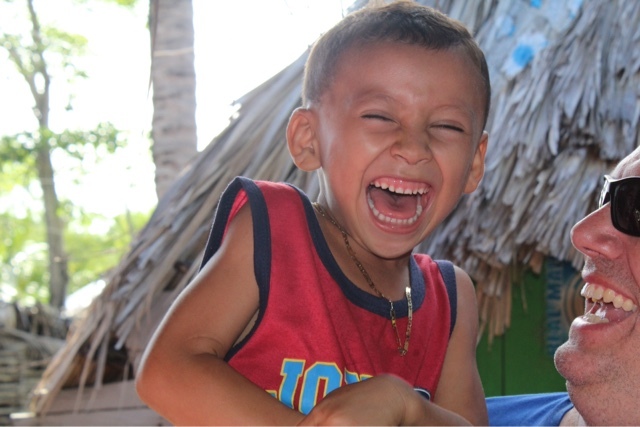 There is truly no language barrier that can separate the fun and loving smiles we shared. One young lady in particular came right up to me and a few other gringos and started acting like we had been best friends for years. She called us all her "Moms #s 1-5". Then "Despacito"started playing and one little girl hopped right out of the pool to dance, turning the heads of everyone without saying a word. Next, we moved on to the beach for some salty fun. 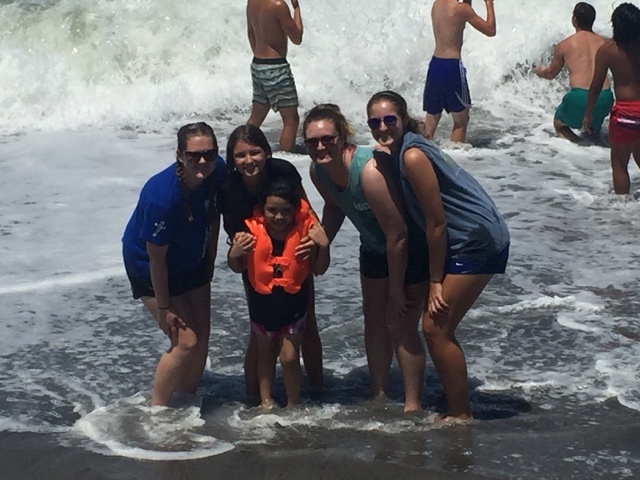 The waves were huge and knocked us down but with hands interlocked, we stood right back up. Alternating between the pool and beach happened until the call for our delicious lunch prepared by States Diner. Following lunch we set up stations for the girls to rotate between. 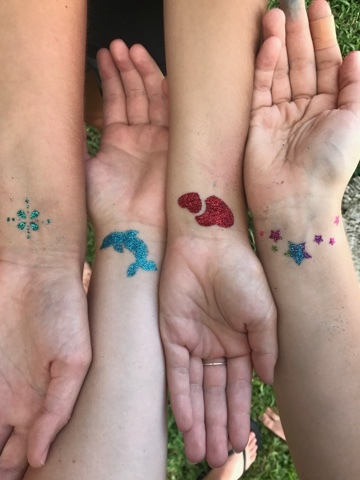 We had games, a bible lesson, crafts, and tattoos. I worked the craft station where we had a makeshift build a bear. The girls picked a patterned bear, drew on the faces, stuffed them, and finally added a small felt heart that was sealed with a kiss. When the bears were stuffed we tied them off at the top and sent the girls on their way to the next station with a new fluffy friend. Other stations consisted of soccer, pool volleyball games that quickly turned in to chicken fights, tattoos galore, and even some tears shed by those that were touched by Kelli Ellermann's words. All the while, the rain held off which was a true gift from God. The girls from the orphanage left around 3pm and the rest of us stayed until sunset. We walked on the beach , took photos and relaxed. In this time, we were able to reflect on our precious time we spent with them. This group of girls was supposed to go to the beach a few weeks ago but it rained all day. God knew what he was doing holding off their beach trip until today. It's safe to say all of our team members were blessed by their company and we hope to have changed their lives in even one small way. I hope when they looked into our eyes, they saw God and the love He has for all of us. From Psalm 37: 7-8, "Rest in the Lord, wait patiently for him to act ...Don't fret and worry--it only leads to harm." This verse is perfect for today. It's all in God's timing and I know in my heart it was our team who was supposed to serve with those girls today. So thank you, Lord, for the opportunity to worship you in a beautiful setting with beautiful people and for clearing the skies for us to have an amazing day. 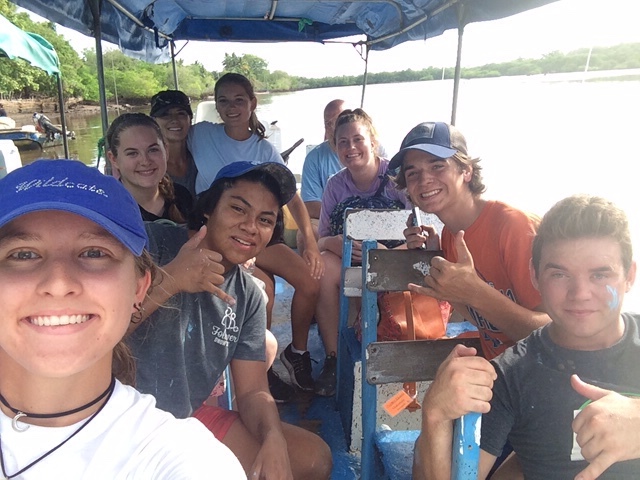 Today we headed back to an island to finish up,working on the houses that we had continued working on yesterday. 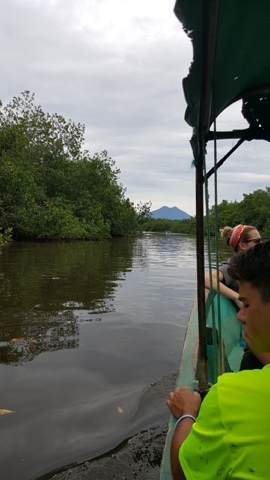 After taking a 20 minute boat ride and seeing a lot of black crabs, we made it to the island. Once we made it to the dock we had to unload all of the furniture for the two houses and all the other supplies we had brought with us for the day. 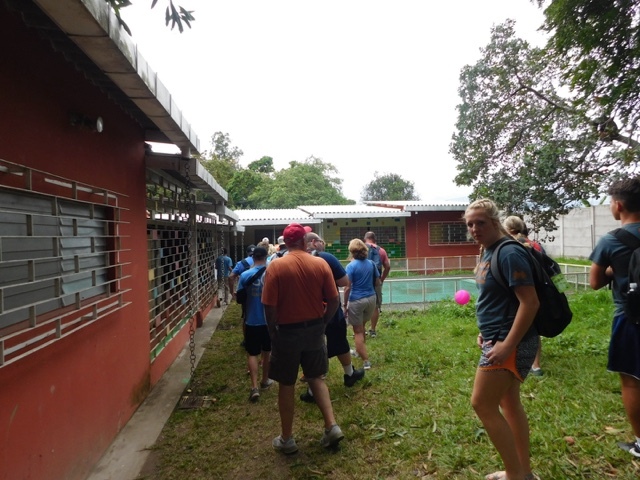 We started our day at the school on the island. They had two classrooms for all the kids on the island. As an elementary school teacher, this was bizarre to me. I am used to having one classroom for my 20-25 students, who are all the same age, but these teachers had two classrooms that they had to split the kids up within. The younger kids, elementary school level, went to school in the morning, and the older kids, middle and high school level, went to school in the afternoon. After visiting with the kids and showing them a puppet show, we began handing out supplies for the kids. Each child got one bag of rice and one bag of black beans, a treat bag full of goodies, and some clothes. 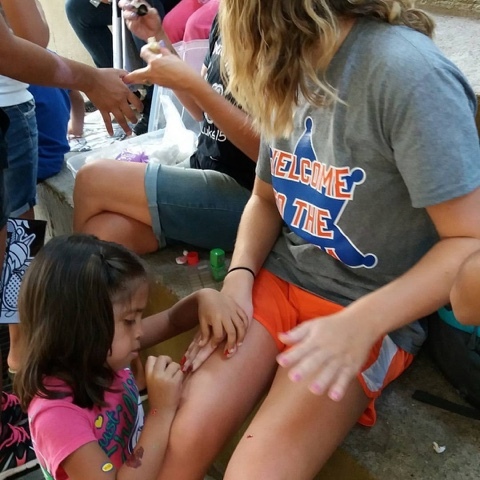 Being able to be the hands and feet of God by proving these kids with food and clothes was such a blessing. Having something to eat and some clothes to wear is something I take for granted, but you could see the gratefulness in these children's' eyes as they received these items. 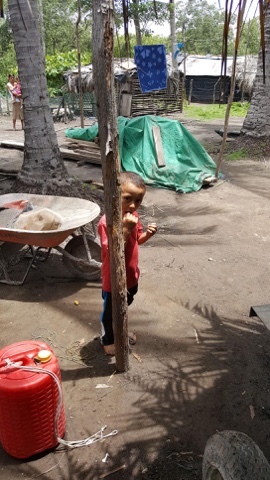 Once we made sure all the kids received everything we had to offer, we began walking to the two concrete houses we had finished building so we could begin decorating and putting the furniture inside the homes. After this was done we got to give the keys to the new owners of the homes. Being able to be a small part in helping make these homes a possibility was a huge blessing to me. After returning back to the mission house and eating a delicious dinner of build-your-own tacos and tortilla soup, we made the meals to go out and feed the homeless. I had already done this two other times this week, but this time would be different because we would be doing so from the bed of a truck. In the two previous times we had gone we rode in a van and handed the food bags out of the window. This time we would be experiencing just a small taste of what these people go through every night. Once we loaded up the truck it began to rain extremely hard. Being in the pouring rain and literally shivering broke my heart when I saw a little boy, probably around 6-7 years old come run up to the truck so excited because he would be getting something to eat tonight. When I handed him his meal he squealed because he was so excited. 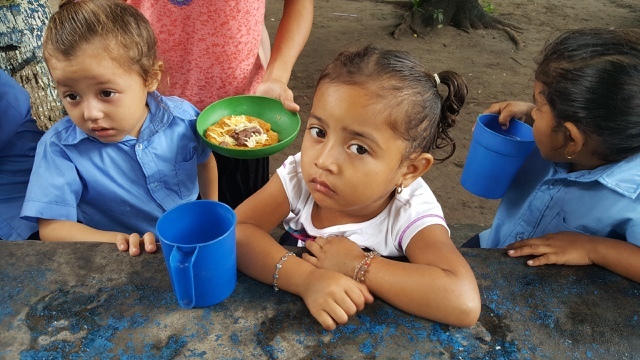 It's hard to imagine having to go through that at all, let alone being a child and living on the streets not knowing where you would be getting your next meal. 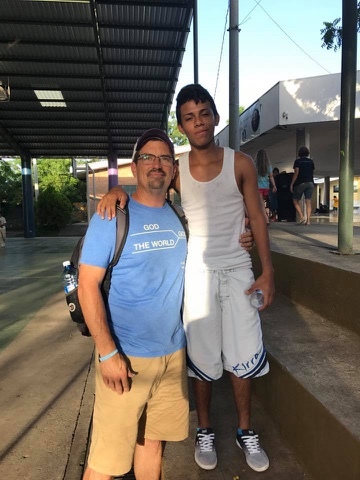 God truly blessed me by sending me on this trip and I know that my heart will be forever changed from everything I have experienced here so far. Matthew 5:16 " Let your light shine before men that they may see your good works and glorify your Father in heaven"
Today was unlike any other, as we continue to adapt to the new and vibrant culture. After waking up and eating French toast casserole, we headed out to the boat. We sailed across to the island on which we are building a Forever Home. 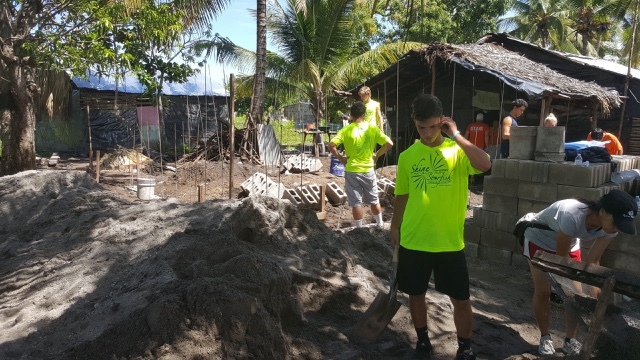 We have the privilege this week to build a home for a family in need across the water from the city. 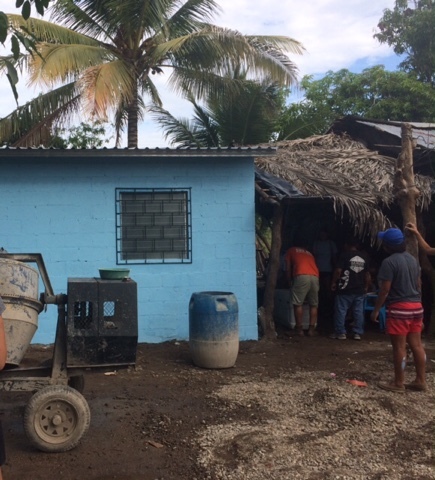 When we arrived, we split up into two teams: one to paint, and the other to pour concrete into the interior of the house. Part way through the building process, we took a break for sandwiches for lunch. At one point after eating, Aaron was approached by a kid in the surrounding area. The kid proceeded to tag him and exclaim, "Mica!" He ran away, followed by around forty kids. 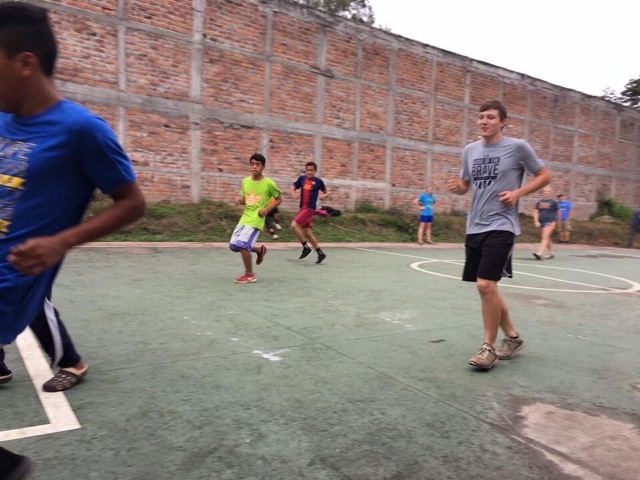 We proceeded to run around and play a never ending game of tag with the Niños by our build site. As if a forty kid tag game wasn't already crazy, paint proceeded to get involved. 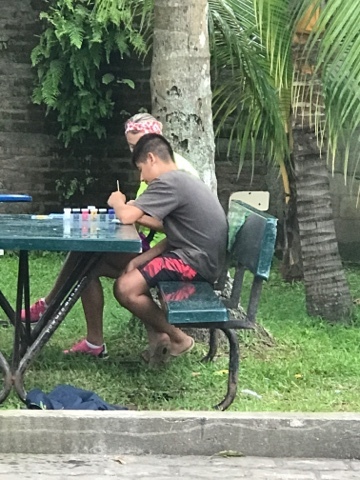 The kids started painting our legs out of the blue. In the middle of this painted mayhem, it was time to clean up and head back to the boat. Covered in paint, our team rode back to dry land. 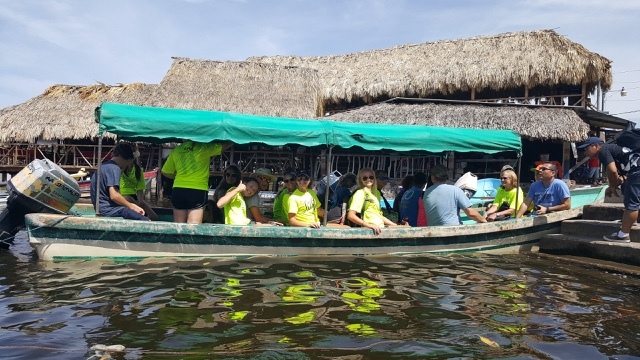 Being 80 some degrees here, the boat ride was extremely humid and water splashes began to be thrown between teammates. Though painted and soaked, today was an extreme blessing. 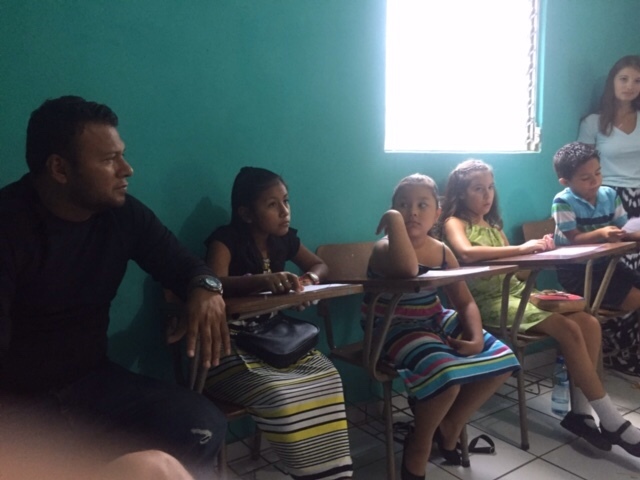 Around El Salvador, Forever Homes are not common. Most homes are easily destroyed and made out of scraps, so for a home to be concrete and indestructible is rare and Divinely planned. 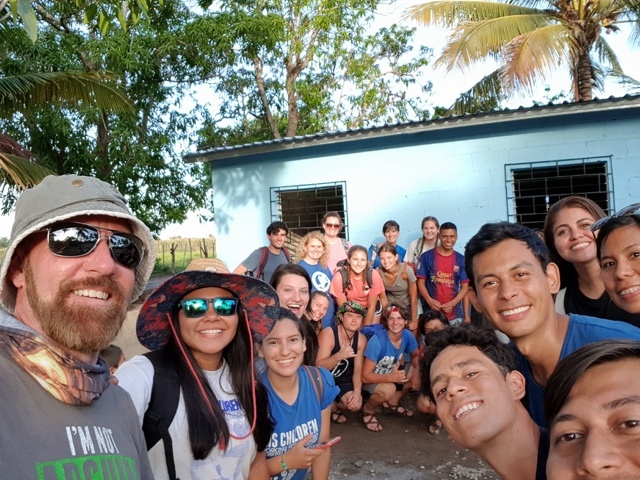 As a team we feel so incredibly honored to be able to provide this home for a family of 9, and have so appreciated being able to put smiles on the faces of these Salvadorians by doing God's work. It's been indescribable to be able to see God's work in this country and are so thankful to be called and chosen as His Children! In 1986 a major earthquake hit the country of El Salvador causing major devastation. Many buildings and homes were destroyed. Numerous families lost their livelihood and were unable to recover. Sadly, many historic buildings and landmarks still remain unrepaired, full of cracks and huge gaping fractures to this day. 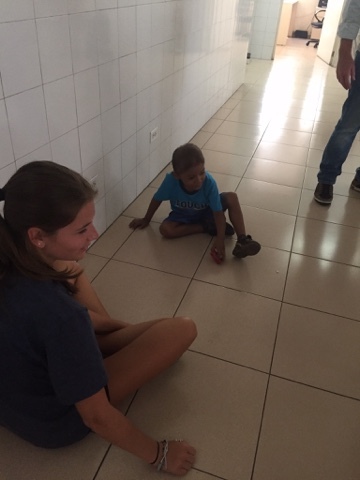 This afternoon we visited Guirola, a special needs orphanage. 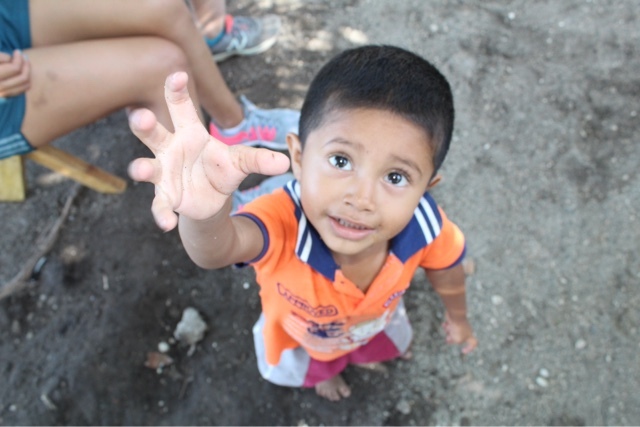 I have been to El Salvador 4 times now, and this was my 3rd time to visit the beautiful children that call Guirola home. 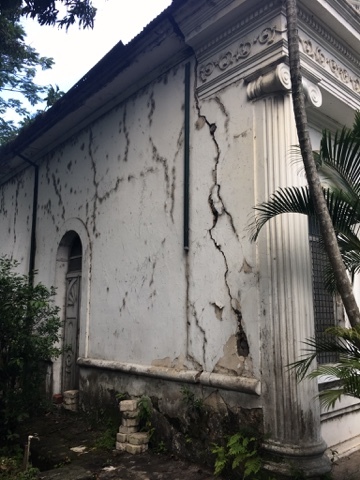 As you enter the gate to Guirola, you pass by a beautiful church that is filled with cracks, holes in the exterior walls, and many signs of aging and decay. However, there is something about this building that has always fascinated me. Where others may see a decaying and cracked building, I looked at each crack and crevice and see a story that is untold. I try to imagine how each imperfection made its way to its resting place and what narrative it would portray. 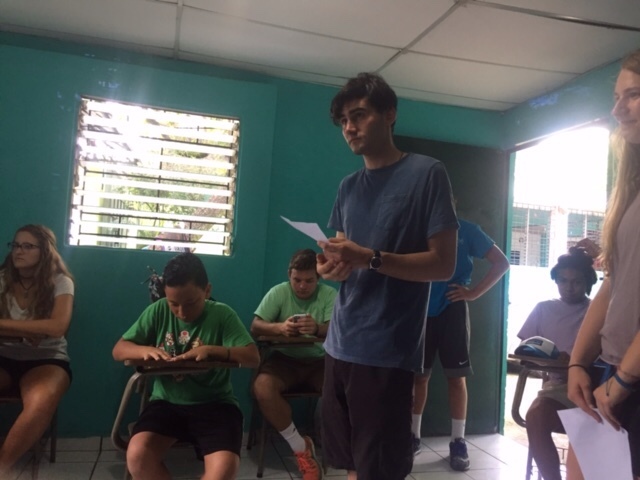 On my first trip to Guirola, one of the translators for Sus Hijos, Josué, took the time to explain the history of the church. After asking a hundred questions and hearing the history, I was even more captivated by its beauty. 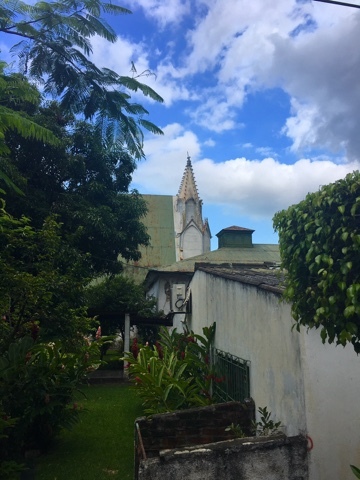 In October while at Guirola, I was able to get an up close look at the church and take numerous pictures. One of my favorite pictures is one of a large crack that runs straight up the side of the building from top to bottom. Today as I stood looking at this same crack, and admiring its beauty and antiquity, it dawned on me how God must see us the same way. Where friends and family members see all of our imperfections and how many times we mess up, and where society sees “cracks” in our lives, God sees beauty. 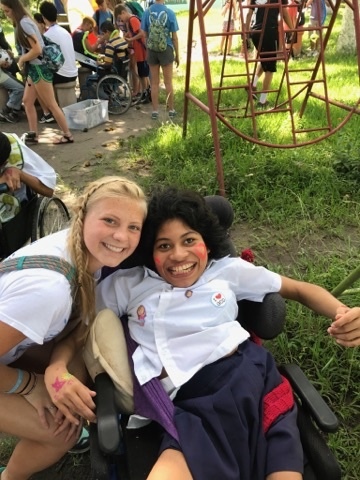 God sees beauty in each of the amazing individuals that our team was so very blessed to be able to visit this morning at San Martin. 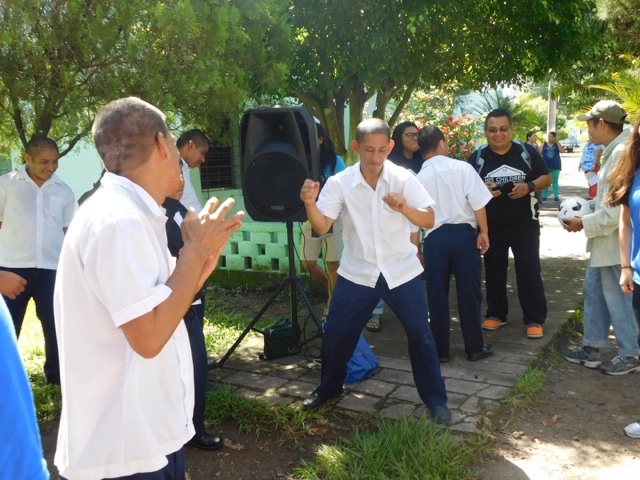 San Martin is a special needs adult facilty. On the exterior, it is not a very beautiful place to look at. The grass is overgrown, the buildings need a fresh coat of paint, and the iron gates leading into the complex are full of rust. However, once you get past the gate, you see how beautiful that place really is on the inside, how happy the people that live there are, and how much your face can hurt from smiling while dancing and laughing. 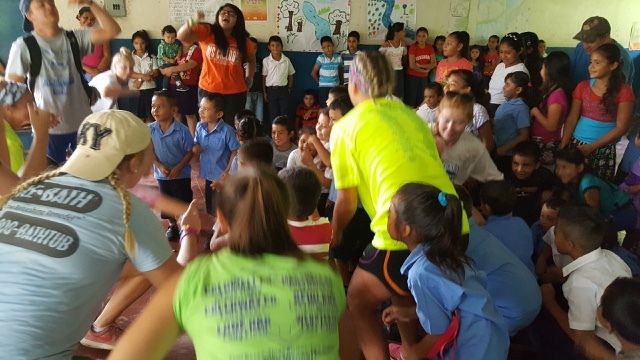 This afternoon, while at Guirola, we were able to play games, dance, and color with the special needs children that live there. We were also each given the task to feed a child his or her dinner. While feeding a child would normally be a quite simple task for me, I could not even get the first spoonful into his mouth. The child that I was asked to feed appeared to be around 8 to 10 years old. He was confined to a crib and had plastic guards on his arms and legs due to violent thrashing fits. Today, I could not even get the spoon close to his mouth because he was moving back and forth so forcefully in his bed. 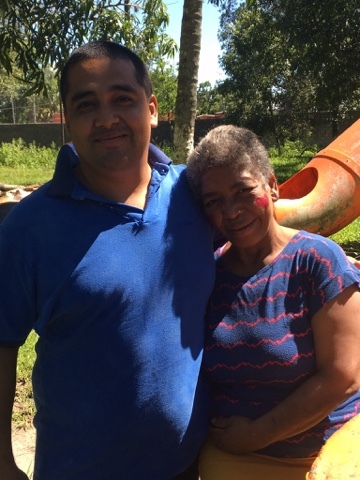 Finally after it was obvious that I was not going to be able to have any success, the nanny, or “tia” as they are called in El Salvador, saw the crack in the situation and came to my rescue. Many times in our society, we tend to overlook special needs individuals. Almost like the Disney movie “Peter Pan”, special needs individuals would be this world’s lost boys. However, we are all lost. And just like each one of us, they have an imperfection. Their crack just happens to be a learning or physical disability. However, in God’s eyes, He looks past the cracks each of us has and sees his wonderfully made creation. He sees His child. And regardless of how many times we mess up or cause another crack to form in the once perfect potter’s clay, He loves us enough repair all of our cracks. Think of how different our life would be if God looked at us and saw all of the cracks that we have in our lives and in our hearts. Think of what our fate would be if He decided that we weren't worth salvaging just because we didn't appear to be perfect. Think about what our future would hold if after self inflicted devastation and destruction, God left us to just recover on our own full of cracks and huge gaping fractures. However, He decided that we were so undeniably worth the cost of repair the minute He stretched out his perfect and unflawed arms and died on the cross for all of our imperfections and flaws. May God help us all to look at others’ imperfections and flaws with the same loving eyes. 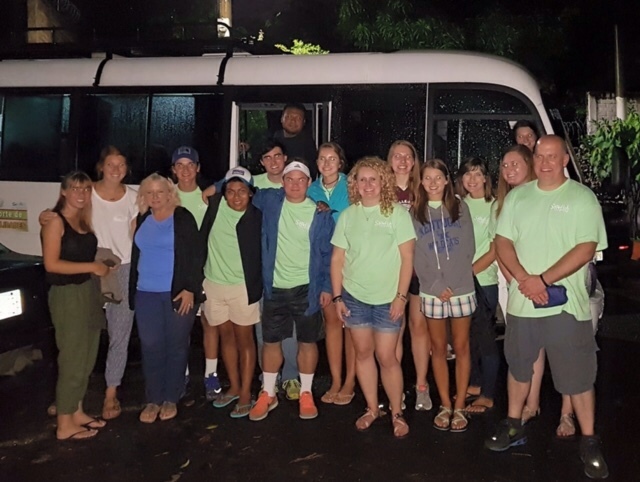 As our team began the journey to El Salvador, we knew we would experience and witness many incredible things throughout the week. 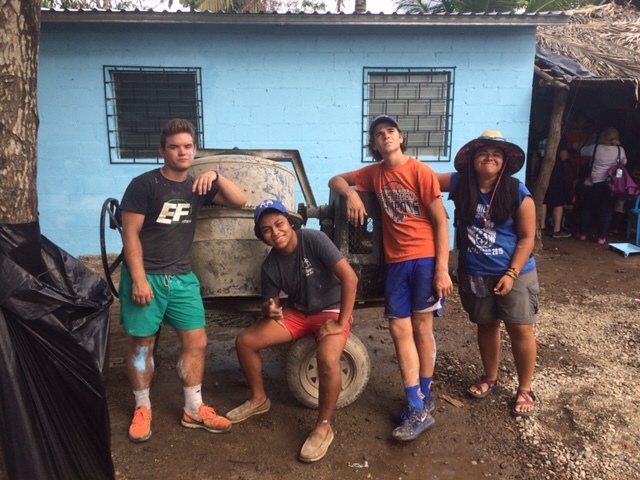 Although there were a few bumps in the road during our arrival, we immediately began to see God work through us when we took our first steps, as a team, into the Mission House. Our first night here, we all got onto a bus and went out to feed the homeless. Within 2 minutes of the ride, we were stopped with people crawling out from under any sort of cover up they used to keep warm, to come to the bus and get a bag of food. Inside the bags we gave the people a bologna sandwich, chips, cookies, an apple, a juice box, and a t-shirt. It may not seem like much to us, but to the people in El Salvador that live on the streets, it's one of the best gifts they could ever receive. 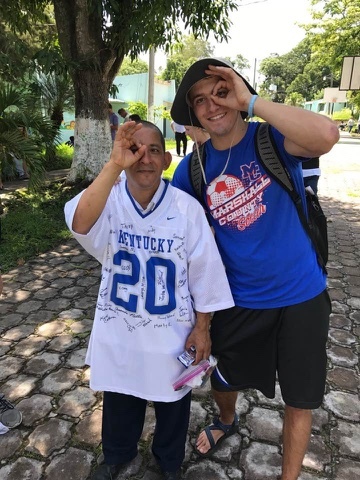 The famous quote, "People say actions speak louder than words," has never been more true than it is on these mission trips. Most, if not all, of the team members do not speak Spanish and need a translator to communicate with the people here. 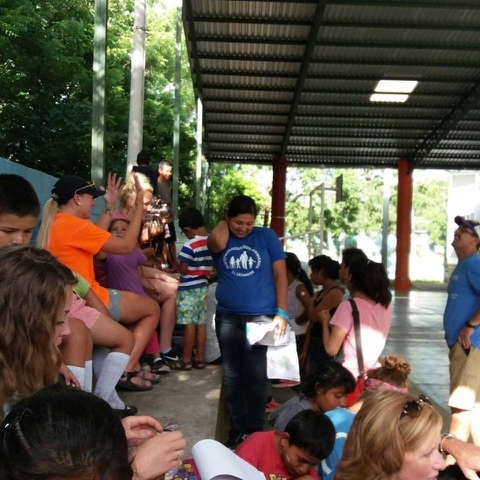 On our first full day in El Salvador, we attended their church service and helped with the children's Sunday School. Their service was in Spanish, where we all got to sit and watch the true cultural experience of a church service in El Salvador, occur. During the service, we were able to stand and hear worship songs that we know in English, but listened to in Spanish. 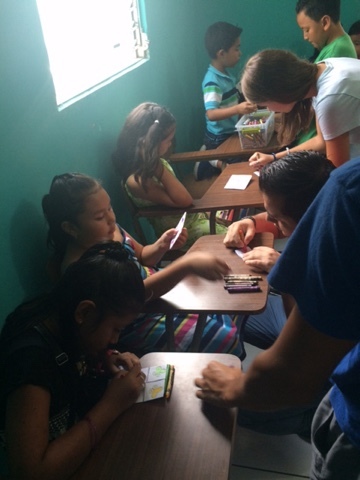 In Sunday School, we gave the children a craft that helped them learn and discuss bible verses. All of us gathered around with the children and involved ourselves in the project. The quote comes in because even though we couldn't have a full conversation, the amount of thank you's we were told shows that actions speak louder than words. 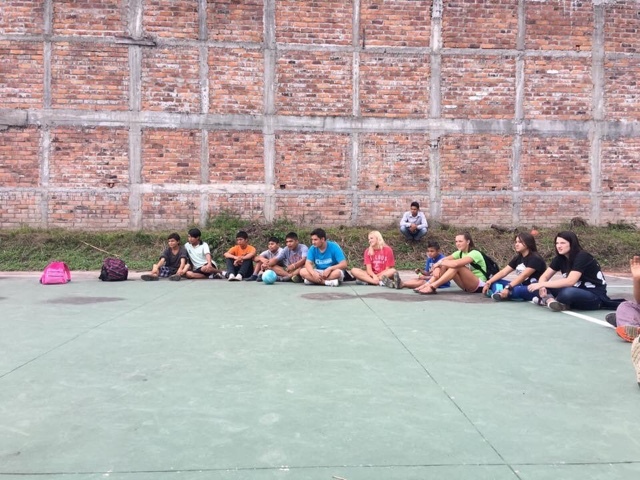 The second half of our first day was spent at an orphanage, CISNA, which had about 27 teenage boys. 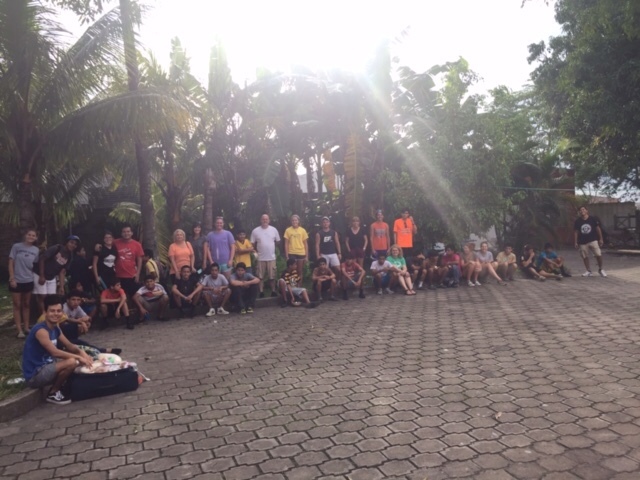 At this orphanage, our team split up into three groups. 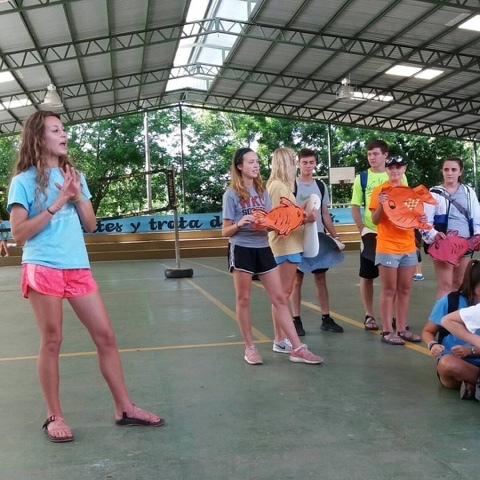 One group for playing soccer, one group for playing volleyball, and the third group for doing crafts. We spent about 3 hours playing with these kids, enjoying their company, almost, if not more than they enjoyed ours, and ended the day giving them a pizza dinner and treat bags. 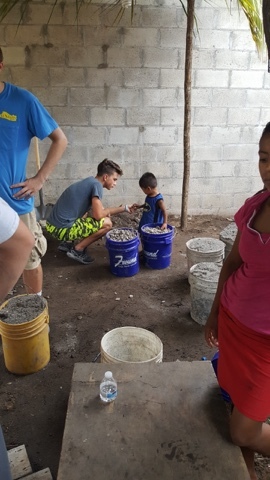 In the last few moments of our visit, an orphan that Starfish had previously built a house for, came up to Laura and said thank you along with giving her his craft that he tried so hard to make. Moments like these make us realize how blessed we truly are, and how much these children can change our lives in just a short amount of time. Thank you to those who are following us on our journey. 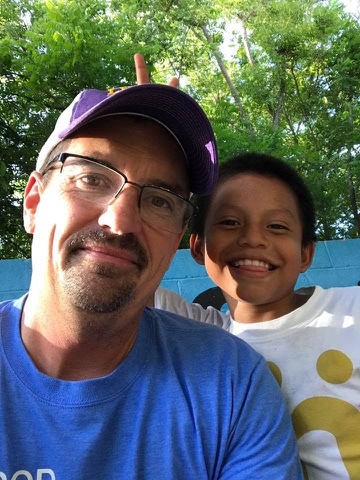 Please continue to send prayers our way and for the people in El Salvador. God bless each and every one of you. To start the day off we set sail for the second time to get to the island where Gods work was to be done! After a 2 hour packed bus ride and 30 minute boat ride we unloaded 99 bags of beans, 96 bags of rice, a PA system, and party supplies for 130 school children. 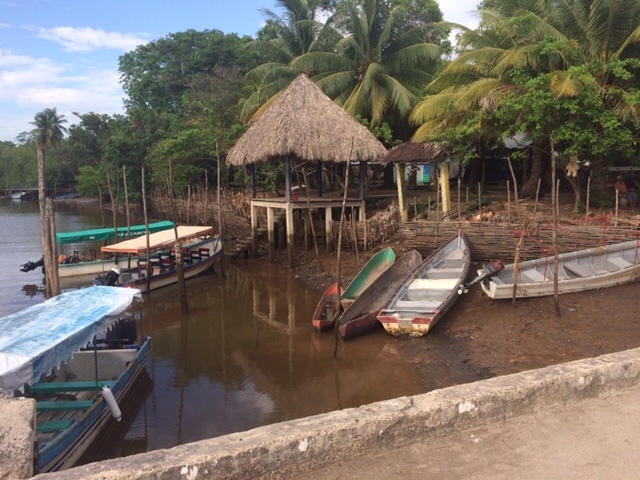 The School on the island was an open area with 2 classrooms, dirt floors, roaming stray dogs, and broken desks. Our eyes did not focus on the devastating conditions, but only on the big eyes and smiles as we entered the school. 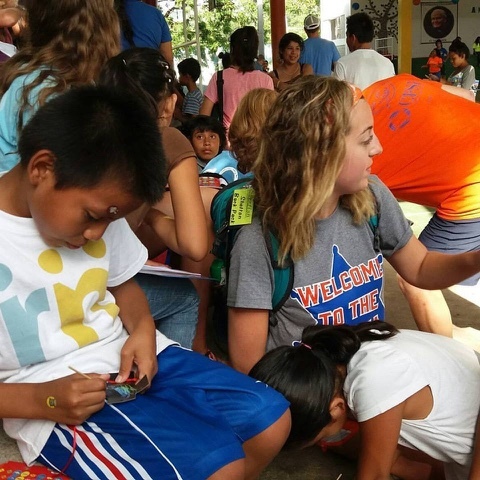 Face painting, bead making, singing, chalk, and soccer changed the atmosphere immediately. 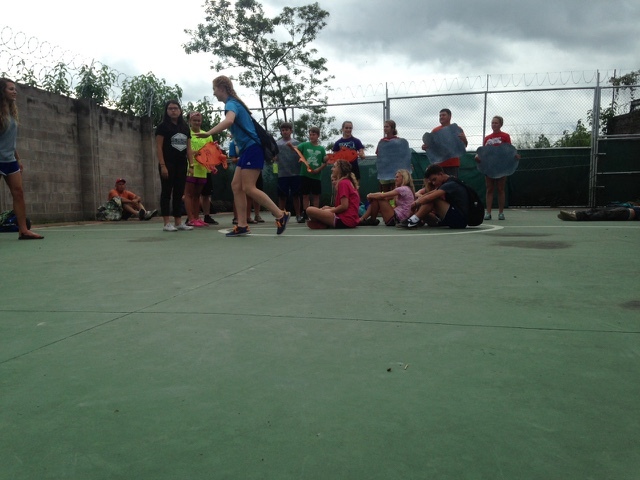 All eyes were on our team members as they performed our "Jesus Walks on Water Skit" in dual languages. The look of joy and appreciation as children clutched their pillow case dresses, stuffed animals, goodie bags, and Bibles made us all realize how much we take for granted. While the skis were blue and the palm trees swayed, the waste, trash, and putrid smells were a constant reminder of the poverty of the island. Straw huts with chickens and pigs roaming freely on dirt floors describe the typical island home. 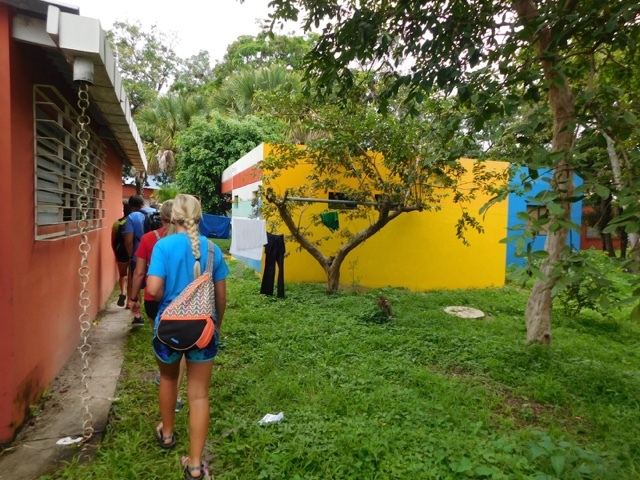 Our team worked to make only a dent in these conditions by painting the first concrete block home neon yellow. Windows and doors will be added to complete this project. 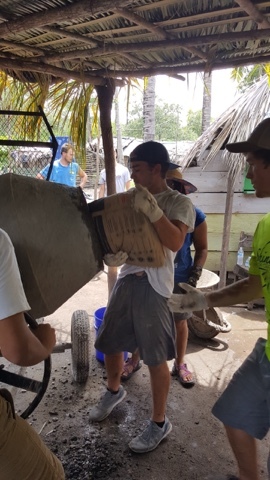 The team divided to begin the construction of another small home by hand mixing concrete, and sifting sand to be poured into the hand dug footers. As well as house building, the others entertained the neighboring children. There is no better feeling at the end of a hot and tiring day than seeing first hand a mother and her children beaming after being blessed with a new home. May we always be reminded of those less fortunate. Are those shark infested waters? We started at 7:30 this am. We drove for 1:45 min and then took the boats to the island. The boat ride was interesting and took about 25 min. We then walked for about 15 to 20 min. We just about finished the first house and started on the second one. The family was really excited and very happy. The group really worked hard. The teenagers were great at working and playing with the kids. These adults are some hard workers. We left the island at about 6:15 with a 2hour road trip ahead of us. God has really blessed us today. We are tired and hungry but we LOVED IT! God is good all the time, and we realized how blessed we are at home in the states. Thanks to everyone who has helped with prayers and financial help. You have helped us bless so many people and this is just Tuesday, I think. Haha Continue to pray please and we thank God for this chance to be his hands and feet! Rejoice with those who rejoice; mourn with those who mourn. Romans 12:15 Today the team saw true Joy! 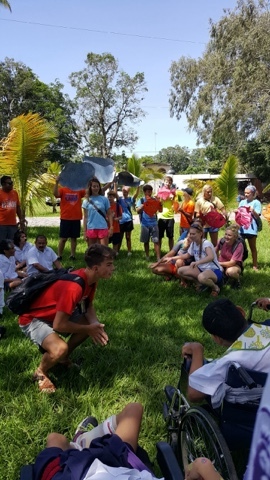 They rejoiced with adults with special needs; People living with what the world sees as great affliction, rejoicing and gleaming with God's love! It is impossible to visit this center and not see the love of Christ shining. Team members shared bible stories, did arts & crafts with the residents and danced the day away! 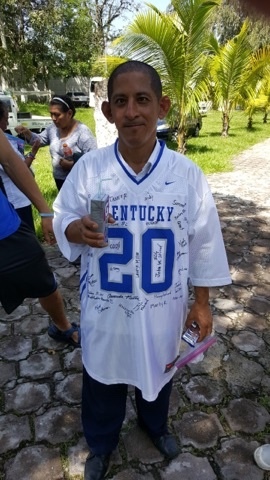 David won the best dancer award & won a UK jersey autographed by the whole mission team! 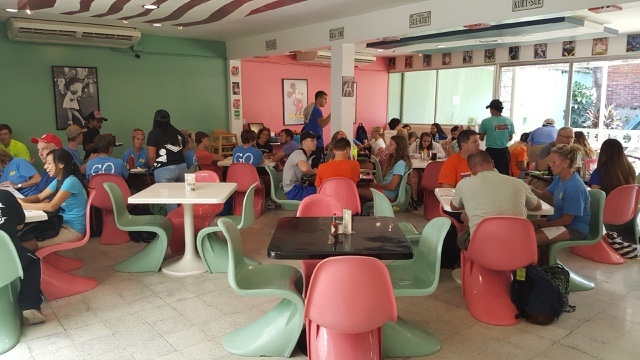 After a full morning, everyone headed to the States Diner, a restaurant ran by teens in the Sus Hijos transition homes. 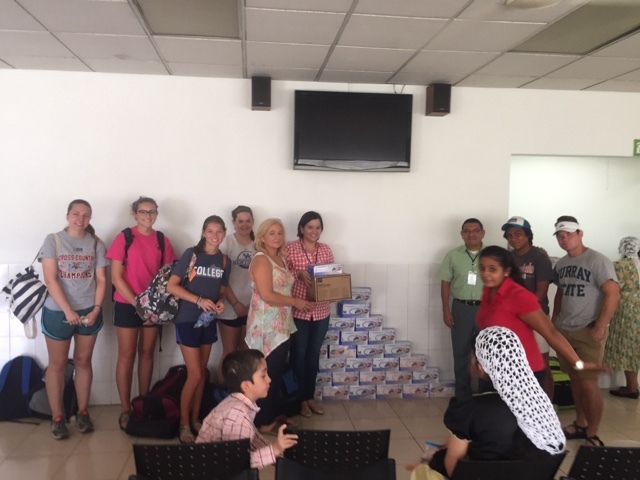 After fueling up on some delicious food, they headed to an orphanage with more than 250 kids. The kids loved the bible story! 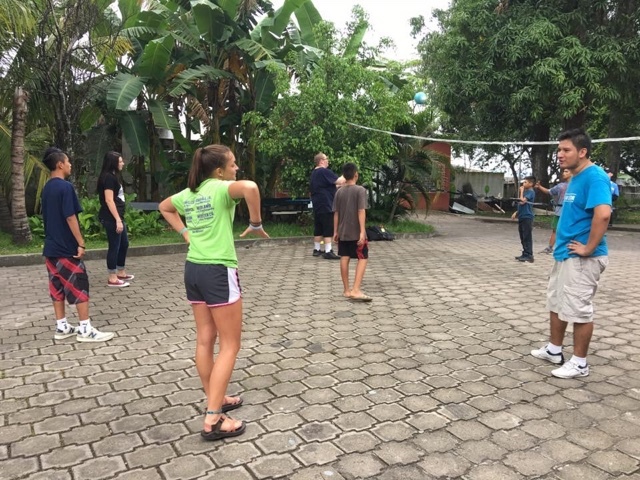 They also shared God's love through playing soccer, basketball & volleyball. While some played sports, others enjoyed expressing their creativity through crafts and other art. 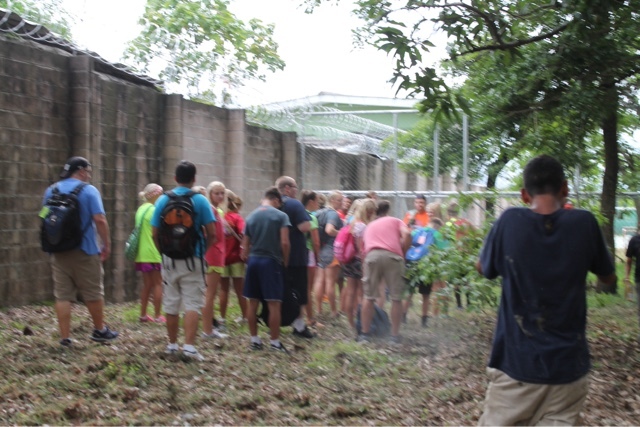 Please continue to pray not only for the Starfish team, but for the hearts of everyone they encounter this week. 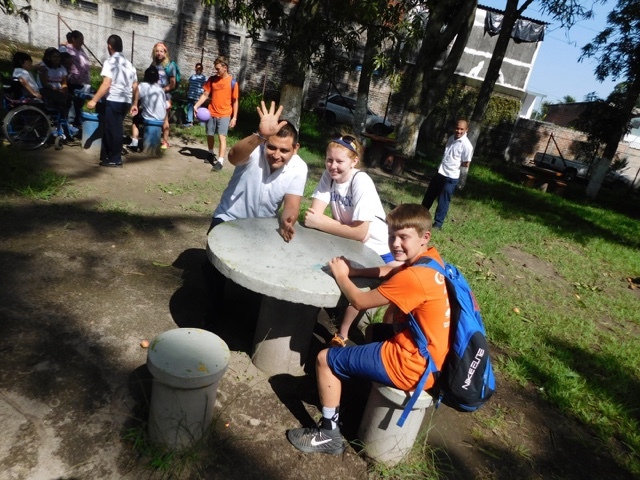 We started this trip with a verse for our mission: to go and make disciples. (Matthew 28:18) Little did we all know, we would be the ones getting humbled and a heart check of our own. Last night a group of us went out to feed the homeless. We prepared one hundred and forty four meals to hand out to people who lived on the streets. We loaded the bus up and headed out to feed. As we drove through the streets we saw the homeless come running to the bus to get their only meal of the day. These people huddled under trash to keep dry and feel safe. The people who were receiving the food were so thankful and giving some of their own meal to there fellow peers. They would take care of those that who were also homeless, especially those who were hurt or weak and couldn't get up to eat. This was a much needed eye opening and humbling experience. We woke up this morning headed to church knowing that the language barrier would be tough. When we arrived we were very welcomed and the people were so happy to see us. They started to worship and these people could sing! After beginning to worship, the language barrier was no longer there, and we were worshiping our God together. It was so beautiful to see different people of different social and financial classes, ages, genders, and races all worship together as brothers and sisters in Christ. The much anticipated soccer playing happened today, we visited the boys orphanage. Seeing the boys reactions were priceless. 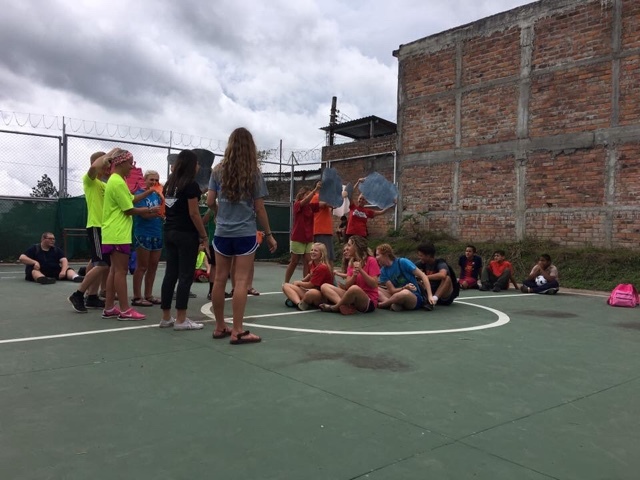 They didn't have the nicest place to stay, but that didn't stop them from enjoying themselves by playing a fun game of soccer. Seeing the boys' reactions and experiencing how grateful they were to just have a fun time was such a humbling experience, and is something many of us take for granted. We all look forward to the amazing things that will take place for us this week. Please continue in lifting us up in your prayers. You may be the only Jesus that person will ever see ever know or ever care to see, so make it count!